Birthday parties are available on weekends only. Make your reservation early—space is limited and dates fill up quickly. 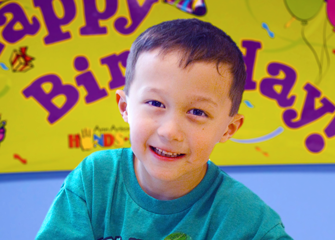 Our party package includes up to 15 children and 20 adults. We can accommodate up to 5 additional children for $10 per child. Fee for extra children will be charged on the day of your party. The birthday child, hosting parents, and all babies 0-23 months are free and do not count against your package. Your own food and/or beverages. Refrigerator and freezer are available upon request. You may arrive up to 30 minutes before the start of your party to set up and decorate. Parties need to end promptly so rooms can be ready for the next group. Full payment is due when you book your party. Parties can be booked up to 3 months in advance. Spaces fill up quickly! You will receive a confirmation packet in the mail after your payment is received. This will include a confirmation letter and schedule of the party’s events. Have more questions? Call us at (734)995-5439 or fill out our Contact Us Form.